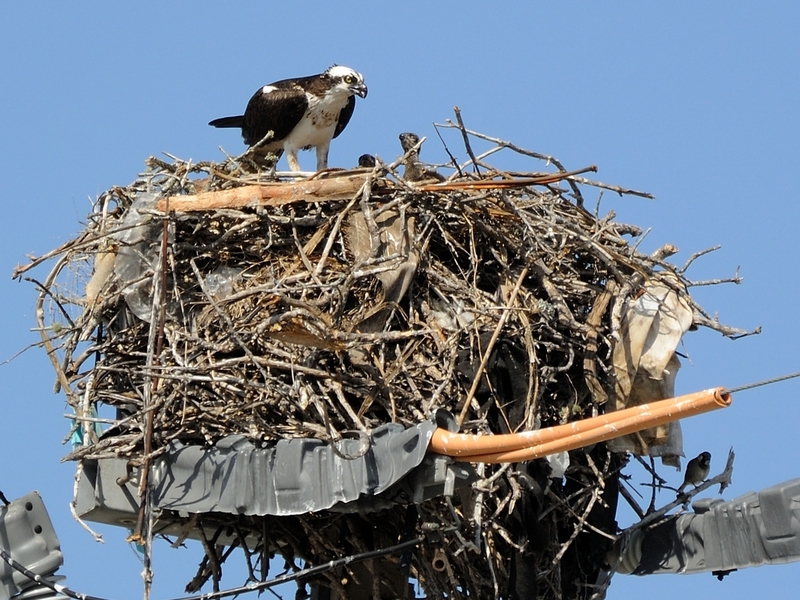 Here in SW Florida we have plenty of Ospreys. So many that they often find odd places to nest. In this case (two blocks from my house) they chose a utility pole. The power company tore it down a couple of times but they always came back. As a result, the power company just extended some insulation on the wires and let them have it. They do trim it back after nesting season. As you can see, the eggs have hatched and the babies can peek over the top. Check out the mockingbird bottom right. This is a multi-family dwelling. There are several nests within the nest and at least one in the hollow steel crossbar. This entry was posted in animal behavior, Bird and tagged Mockingbird, Nikkor 30-110mm, Nikon V1, Osprey. Bookmark the permalink.